In the past couple years we’ve seen numerous electronic manufacturers dive into the new true wireless earbud market. Most are rolling out their first crack at it, while a select few were early starters and now have second iterations that don’t feel so beta anymore. One of the newest well-known manufacturers that are in the former camp is Sony. The Japanese giant has a well-placed presence in the audio market, not just with general headphones but wireless offerings that boast some of the best active noise-cancellation (ANC) tech thus far. 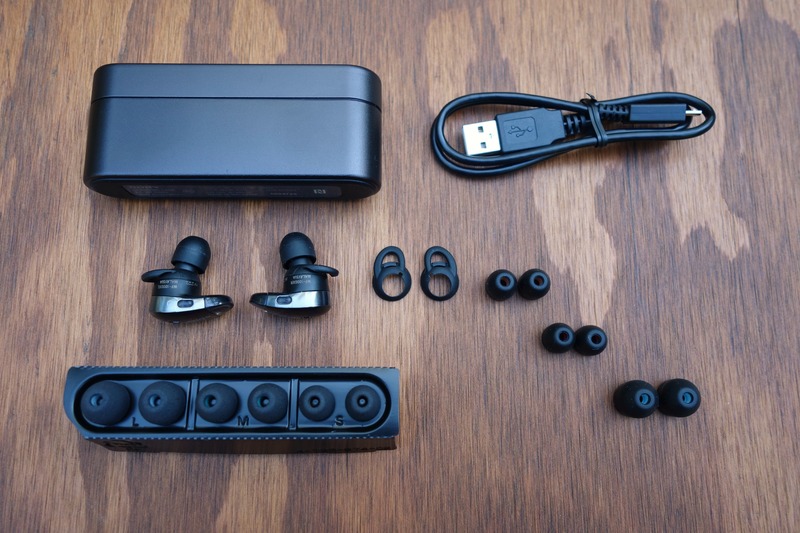 Its over-ear flagship sequel, the WH-1000XM2, has garnered a lot of praise. 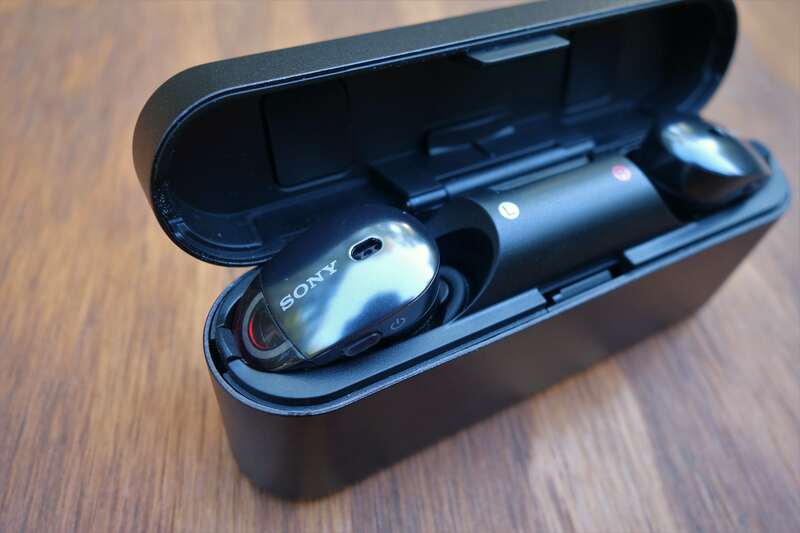 But can it deliver a first-gen pair of true wireless earbuds that hold the same excellence as the rest of their headphone line, and not fall victim to the same downsides as the rest? That’s what we’re here to discover. To boot, we’ll say that fitting in ANC into such a small package is darn impressive, and something that others cannot claim. One thing we really like about Sony’s designs is that they rarely follow in others’ footsteps. 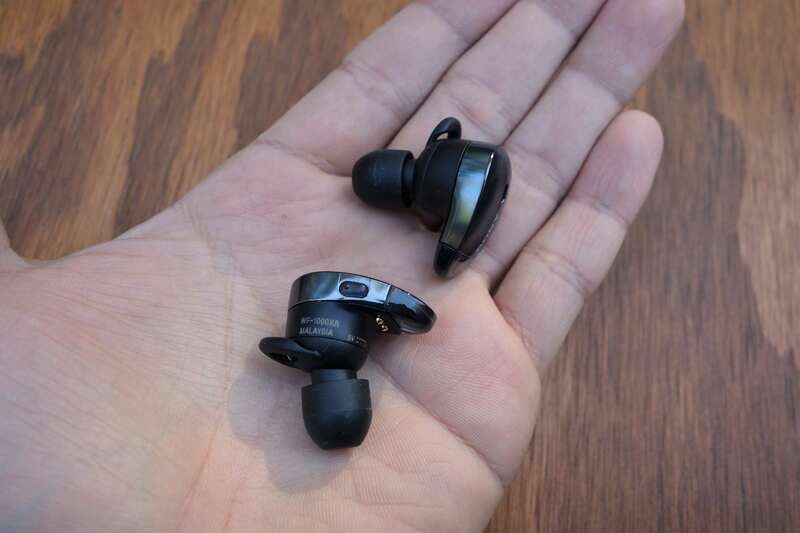 Case in point, the shape of the WF-1000X don’t look like any other true wireless earbuds currently on the market. They bear an L-shape that may initially draw confusion on how to exactly don them. But it quickly becomes apparent as soon as you realize the proper orientation. Grasping the ear tip stems and pointing the other end forward reveals how they insert in your ears. The ear tips are angled to match the shape of your ear canal. We think the reason for this design is due to all the technology at Sony desired to pack in. So instead of going outward from the ear, they wrap around a bit towards the front. This is clever and in practice, there’s no downside that we found. Despite their size, the earpieces are still exceptionally lightweight. They practically disappear in your ears. 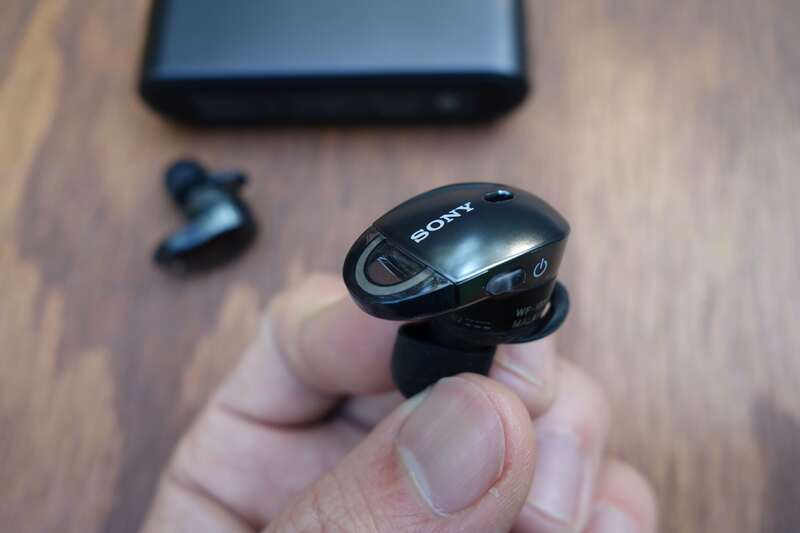 This design choice also enables Sony to have great separation between the audio driver and wireless-enabling electronics. We think this is one reason for the WF-1000X’s above average sonics (we’ll talk about the audio quality a little later). Speaking of the build, it’s all plastic but with a finish on the primary shell that looks metallic. Our “Black” model has more of a reflective dark gray that has an attractive sheen in light. It transitions to a smooth, matte finish on the ear tip end and a small window on the other end (where a wireless receptor is visible). To reiterate, these earbuds are the in-ear (or in-canal) type, so the seal that the ear tips make in the ear canal are a big proponent of the sound quality. 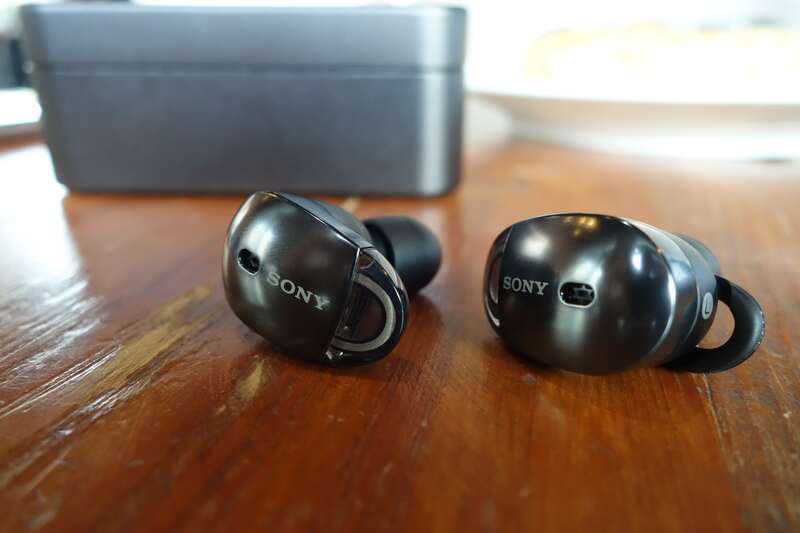 Sony’s ear tips are a firm, bullet-style and they go in pretty deep. We had no problem getting an appropriate seal. In the case that you don’t, Sony includes three different sizes of not just the typical silicone material but also foam. We didn’t have any issue with the WF-1000X falling out, even while working out (which we don’t recommend because they’re unfortunately not water/sweat-proof). The silicone ear tips have a sticky finish that cling to your ear canals. They are very comfortable and we didn’t get any aches whatsoever. 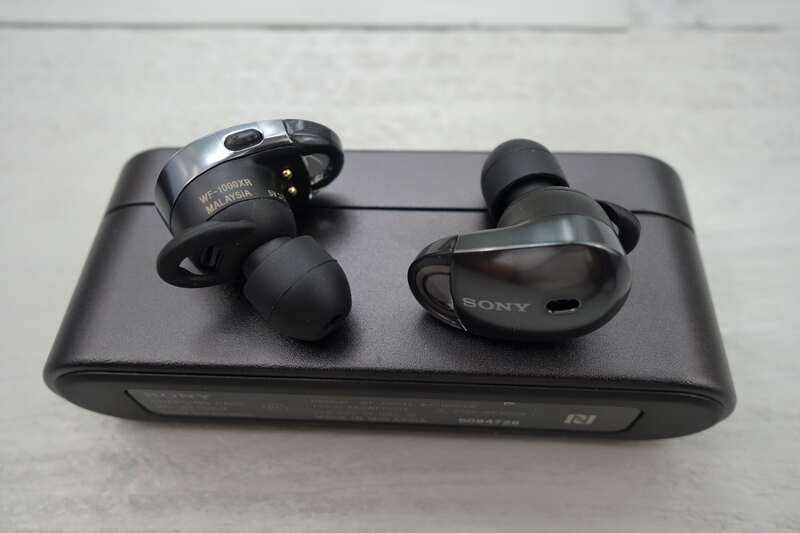 The packaging also comes with a USB-A to micro-USB charging cable, user-installable ear fins (for extra support), and a premium-feeling metal carrying case that has a battery within. 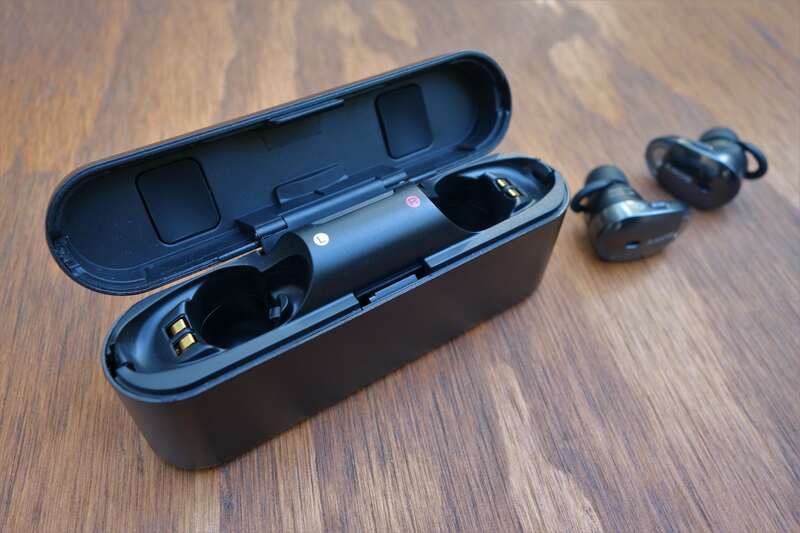 True wireless earbuds struggle with battery life (the WF-1000X are no exception), so manufacturers typically put a battery in the carrying case to assist. This case has enough capacity to charge the WF-1000X through 3 cycles. This is great to have, but with a measly 3-hour rating, many your sessions will probably be cut short and you’ll have to wait until they charge up before continuing. Sometimes the future feels like we’re going backwards. 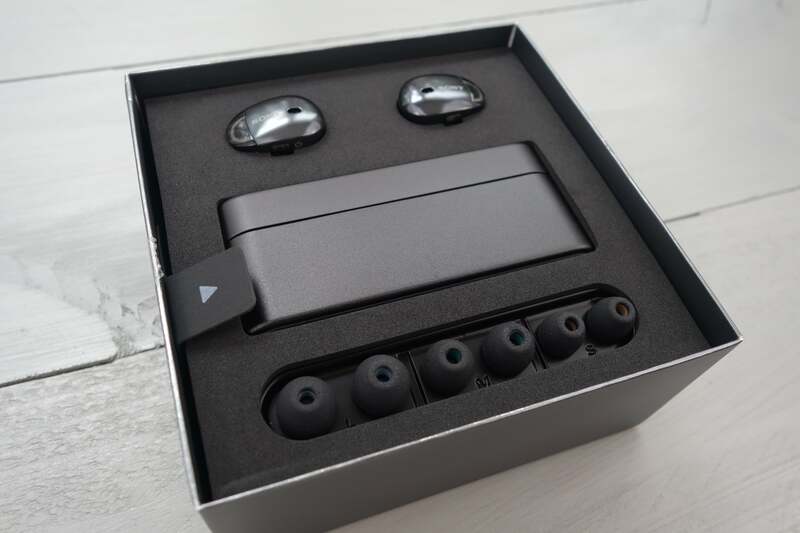 The earpieces have their specific Left and Right silos in the case. They have two pins that match up to the magnetic connectors in the case. They click into place nicely, but you do have to make sure that they get seated correctly. One time we thought we did and then ended up with no juice on the right earpiece. There’s a blue and red LED indicators that light up from the transparent portion of the earpieces. Red will shown when they’re charging. A blue flash tells the user that the earbuds are on, but they stop flashing once they’re set in the ears and the Bluetooth connection is stabilized. It’s always interesting to see how manufacturers implement the user controls in these little guys, being that there’s not much room to work with. Some try touch controls while others try different button placements. 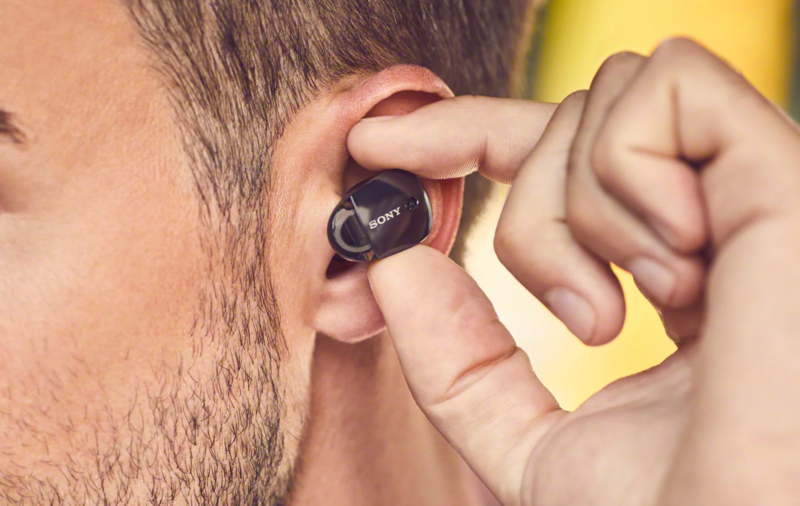 Sony opts for buttons, one on the bottom of each earpiece. 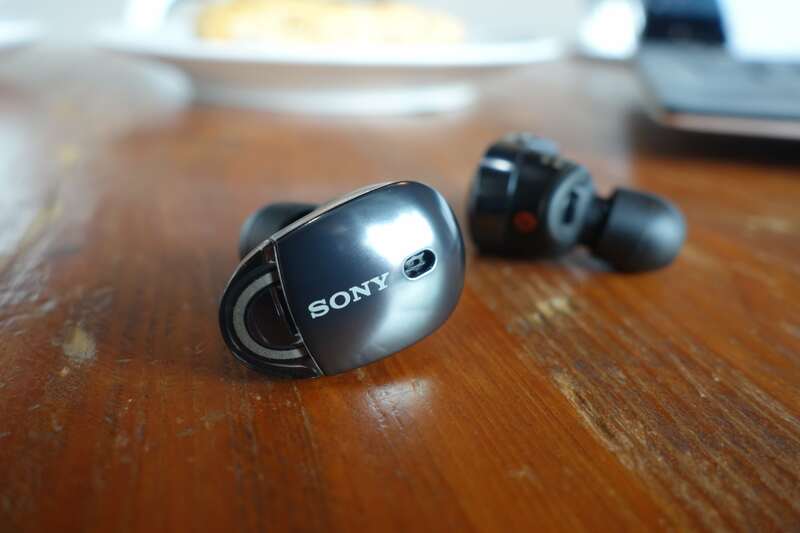 The left earpiece controls the power and mode of ANC (Sony has three sound modes: ANC on, ANC on but with audible higher frequencies, and ANC off), and the right earpiece controls playback in the typical method: single press for play/pause, double press for next track, triple press for previous track, and long press to toggle the mobile device’s virtual assistant (i.e. Google Now on Android). The buttons worked well in our use. Finding and pressing them can sometimes rock the seal, but nothing major. I’m usually the type that likes to just plug and play. So I booted my experience with the WF-1000X by simply taking them out of the case, pairing with Bluetooth on my phone, and playing. I knew that Sony had an app that accompany the earbuds, but meh. Well, I soon found that if you want to access to the full volume capacity, you have to use the app. I was hitting the volume ceiling with just plugging and playing and got super worried for these headphones. The app has an independent volume control, for whatever reason. So what I did was cranked it up from that end so that I can solely have volume control on the Bluetooth end. This is an easy enough fix, but we still don’t agree with it. It’s not intuitive. The app shouldn’t be a necessity. I can picture users returning the WF-1000X upon running into the low volume and not realizing that the app can fix it. 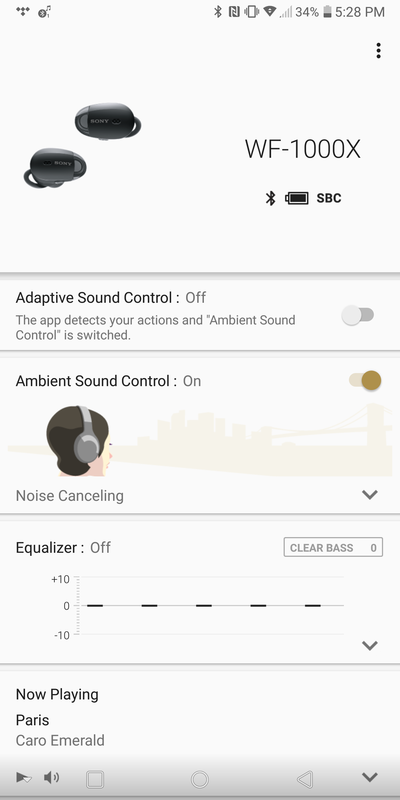 The Sony Headphone app has various feature control for the WF-1000X. 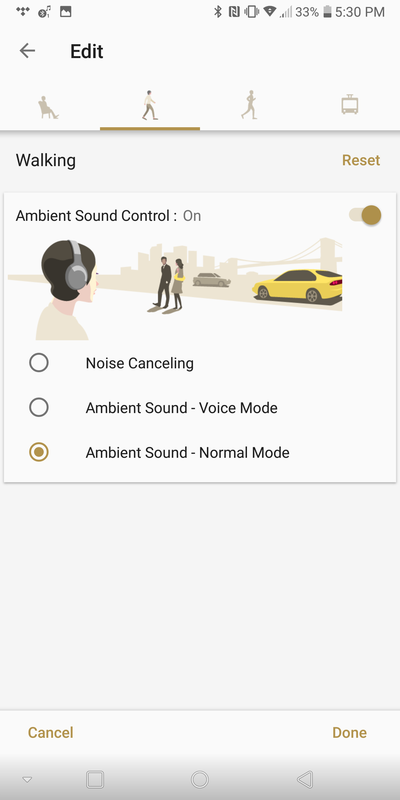 In the app, you can set the ambient mode to automatically switch to suit what you’re doing (sitting, walking, running, or traveling). 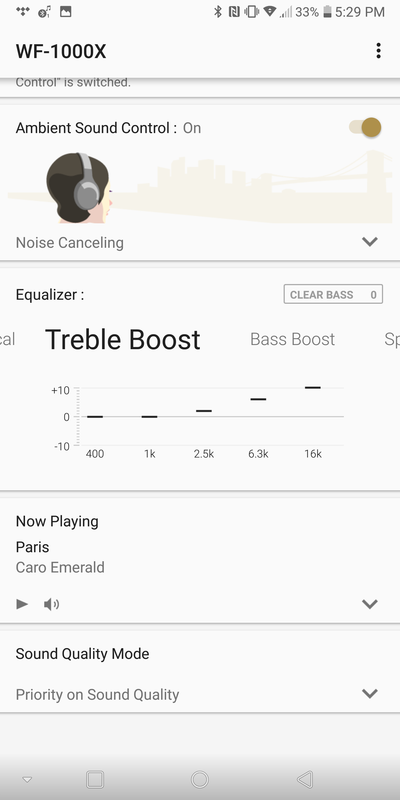 Sony includes an equalizer with various presets (but not user-customizable). 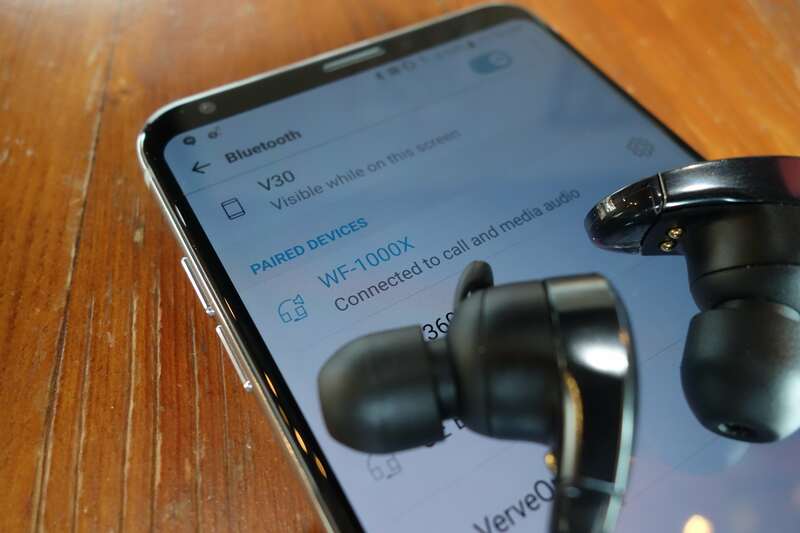 Most true wireless earbuds struggle with the Bluetooth connection. It’s understandable, since the receptors must be tiny and the range compromised. The WF-1000X are certainly not exempt from this issue, despite its design to move the receptors further out from the ears. We can’t say if the fault falls on hardware or software. Not to scare anyone, signal drop-age isn’t particularly a whole lot worse than other true wireless earbuds we’ve tried. Typically enough body movement between the source device and earbuds do it. But we have found that the signal can spaz out randomly on the WF-1000X. Usually it’s the right earpiece that gets lost (these earpieces use a master/slave relationship – the left earpiece is the master and the right links to it) and takes a few seconds to recover. Our experience with this is best described as hit or miss. Sometimes it would chug through flawlessly and sometimes it would struggle to recover. Additionally, a few times when we took the earpieces out of the case for a listen, only the left earpiece would play. We would then have to placing them back in the case so they shut off and reset and that did the trick, but annoying. And alas, there’s the ANC. To first set the stage, we have to caution that the performance of the ANC here is not going to be on the same level as something like the Sony WH-1000XM2 or Bose QC 35. It helps block noise but it’s going to be near dead silent. We’d say it’s about half level of those. It’s up to you if that’s meaningful or not. It is in our opinion. It’s pretty amazing to have ANC at all in something this size and this challenging to engineer. In other words, we’ll take whatever we can get. In practice, you’ll mostly be cancelling out low-end rumbling, like a white noise in an office space or the rumbling of a dishwasher. Same goes for an airplane, but in this case you will pick up the higher frequency whizzing from the engines. The WF-1000X easily pair to our Android phone, but Sony includes an NFC receptor on the bottom of the charging case for even quicker setup. The WF-1000X is not going to rival any headphone in the $200 range for clarity or analytical details. That said, it is no slouch either. Dynamics are stellar, reaching higher than the price would suggest. Soundstage is also a strong suit relative to the competition. This means that the sound isn’t cohesively flat. It’s open, airy, and notes have depth/dimensionality and impact. If you can look past high fidelity, it’s a very enjoyable and engaging sound. Together with the noise-cancellation, it’s easy block out the out the outside world and get lost in the sound. In other words, Sony makes up for fidelity (which is in no way bad) with delivery and noise-cancellation. Speaking of the frequency response, it’s fairly well balanced. As of late, Sony has been doing a great job getting a nice balance between neutrality and energy. The range upper bass to mid range is wonderfully present and well separated. But sub-bass doesn’t go as deep as you can get up the price chain. Likewise, the treble is appreciably detailed, but it not with standout quality or reach, just decent. Like most wireless, ANC headphones, the WF-1000X isn’t exempt from low-level hiss. But it’s within the realm of reason. Unless it’s a quiet passage, the music drowns it out. The WF-1000X are an…interesting pair of true wireless earbuds. They have a couple standout highs but also some potentially deal-breaker lows. We’d be able to recommend them, but with a glaring caution based on the iffy wireless signal – but this is significantly better now since the firmware update. The WF-1000X sound quality is definitely where it should be for the price tag. What puts it over the edge is noise-cancellation, which no other truly wireless earbud can claim. If you value sound above other things, and want absolutely no wires, then the WF-1000X is the best that you can do at the moment.